We partner with Adopt a Highway Maintenance Corporation to administer the program. It provides all marketing, sign installation and litter-removal services at no cost to the state by obtaining sponsorships to fund these operations. Sponsored areas are recognized with an acknowledgement sign displaying the sponsor's name, logo or both. Acknowledgement signs are not intended to be an advertising medium, or any kind of forum for public speech or political opinion. 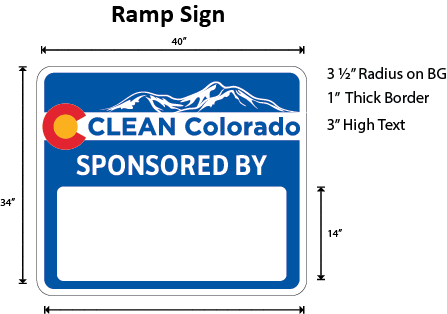 All highways and interstates under CDOT's jurisdiction are included in the Clean Colorado program. The cost to participate in the program varies by highway and frequency of cleaning. Highway and interstate sections are sponsored in one-mile segments, and are cleaned either 12 or 26 times a year. Available ramps, rest areas and chain-up stations are cleaned at least 12 times a year. Since the inception of the Clean Colorado program in 2005, participation continues to grow among businesses and organizations that have civic pride and are committed to giving back to the community. Best of all, this program costs the traveling public nothing; no state funds are expended to generate these great litter-removal services, and the program allows our department to better utilize maintenance time and funds to be directed to more substantial safety-related activities. 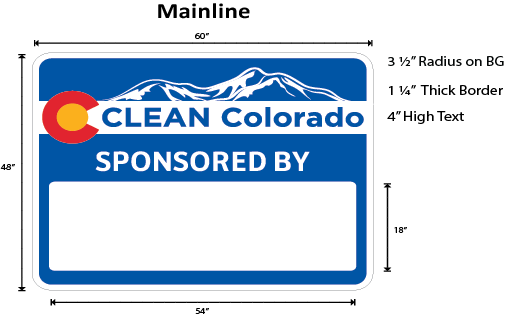 To help us CLEAN COLORADO, please call Bill Elliott at 1- 800-200-0003 ext. 302, or visit the Colorado Sponsor a Highway web page for more information.